At a time when Shakespeare is becoming increasingly globalized and diversified it is urgent more than ever to ask how this appropriated ‘Shakespeare’ constructs ethical value across cultural and other fault lines. 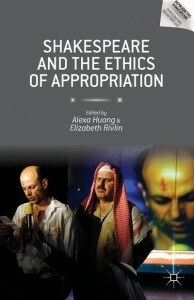 Making an important new contribution to rapidly expanding fields of study surrounding the adaptation and appropriation of Shakespeare, Shakespeare and the Ethics of Appropriation (edited by Alexa Huang and Elizabeth Rivlin) is the first book to address the intersection of ethics, aesthetics, authority, and authenticity. The collected essays approach ethics from a rich variety of perspectives: some explore how ethical issues in Shakespeare’s plays have been received and interpreted, some investigate the ethical commitments of Shakespearean appropriations, and some interrogate the ethical tenets that underlie the processes of adaptation and appropriation. As a whole, the volume suggests that appropriations are always on some level comparative and that their work has value in generating sites of discussion between otherwise strongly divergent frameworks of understanding. 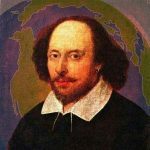 In addition to Global Shakespeares co-founder Alexa’s co-introduction, also featured in the book are Global Shakespeares regional editor Margaret Litvin’s article and interview of Sulayman Al-Bassam. The book is available through Amazon.com, Amazon.co.uk, Palgrave, and elsewhere.